RGE’s Director for External Affairs Goh Lin Piao recently met senior public officials at an exchange from Africa to share with the Group’s philosophy, practices and programmes on sustainability and corporate social responsibility (CSR). 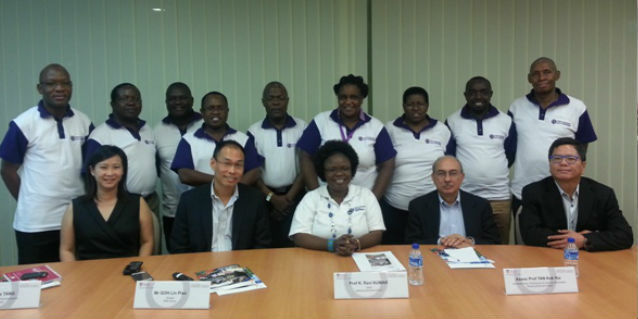 Ethics & Integrity Institute (EII), a three-year old NGO that advocates ethics in organisations, led the ten-member Kenyan delegation in Singapore for a week-long visit to learn about servant leadership and CSR best practices adopted by Singaporean companies. 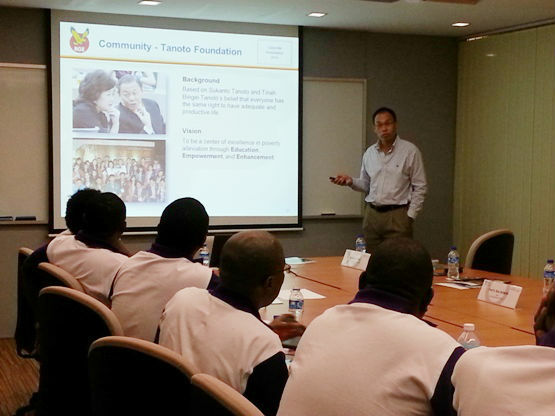 The visit was facilitated by the Nanyang Business School’s (NBS) NTU-SBF Centre for African Studies. RGE external affairs director Goh Lin Piao introducing the Tanoto Foundation’s objective of alleviating poverty through Education, Empowerment, and Enhancement. After visiting the Centre for African Studies, the delegation learned from Mr Goh how respective businesses and groups associated with RGE continue to improve the environment and community. 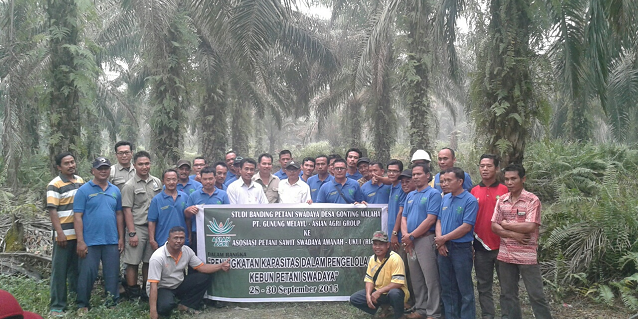 Sustainability practices such as responsible forests and land management and eco-restoration projects in Riau were shared and discussed. 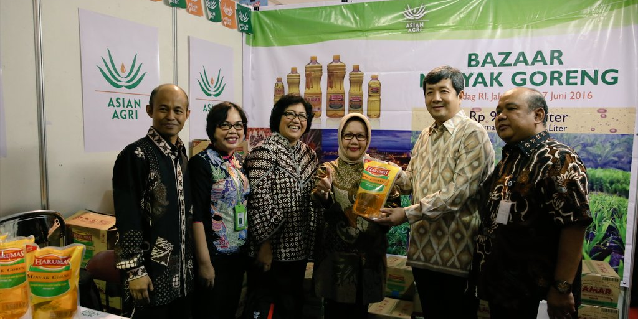 They also learned how programmes like the Schemed Smallholders programme (Plasma) championed by Asian Agri, and Tanoto Foundation’s education and empowerment programmes continue to positively impact infrastructure, quality of life and literacy. The two-hour session covered discussions on governance, business and human capital development. It also provided a platform for a unique cross-cultural and cross-sector (academia, NGO, public, corporation) dialogue. The meeting soon recognised how resource-rich countries like Africa, Indonesia and China needed strong leadership with the integrity and commitment to drive the adoption of best practices and champion sustainable development. 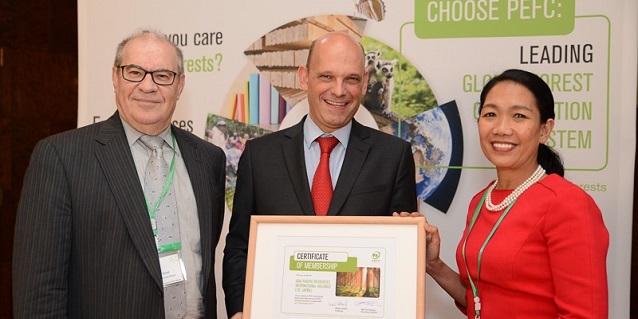 RGE (Royal Golden Eagle) is a global group of resource-based manufacturing companies in the forestry and energy industry. Our work ranges from the upstream, comprising sustainable resource development and harvesting, to downstream, where our companies create diverse value-added products for the global market. Our commitment to sustainable development, conservation and community development underpins our operations, as we strive towards what is good for the community, good for the country and good for the company. RGE is founded by Sukanto Tanoto in 1973 as RGM. The assets held by RGE companies today exceed US $15 billion. With more than 50,000 employees, we have operations in Indonesia, China and Brazil, and continue to expand to engage newer markets and communities. Tanoto Foundation is a non-profit organisation established in 2001 by the Sukanto Tanoto and his family, whose philanthropy dates back to 1981. It strives to be the centre of excellence in poverty alleviation through education, empowerment, and enhancement of quality of life.